Posted on January 27, 2014	by Smiling Road Warriors! 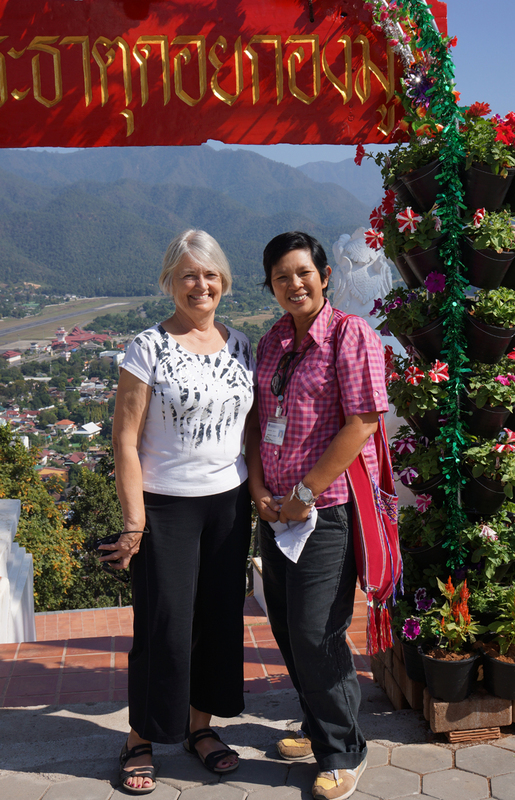 Our flight westward to the remote town of Mae Hong Son from Chiang Mai took only about 40 minutes. The scenery on the way over the mountains was spectacular. 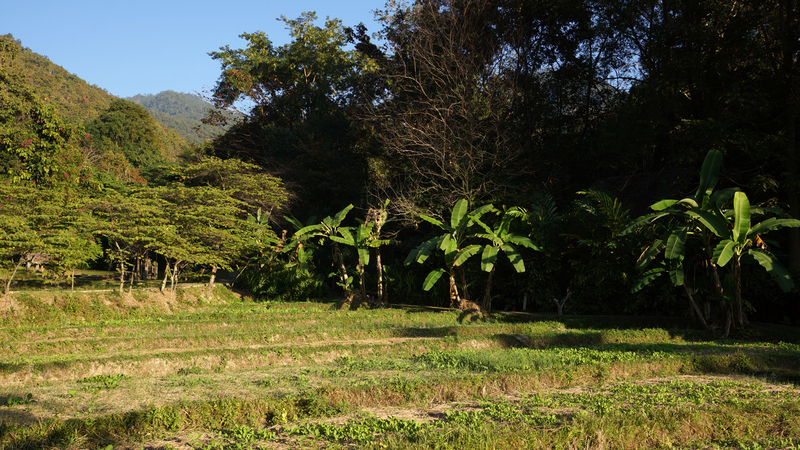 This is some of the most varied scenery in all of Thailand, consisting of mountains, lush forests and valleys, and swift clear streams. 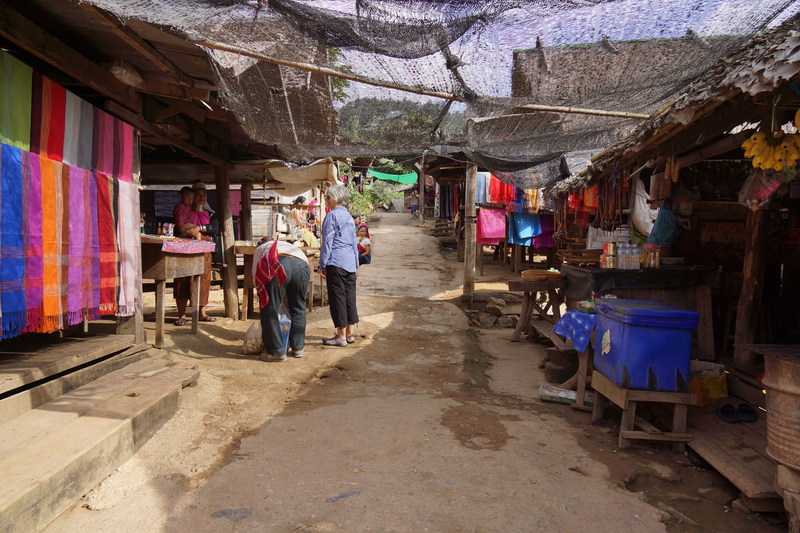 Since it is also situated on a few kilometers from the Burmese border, we could see a number of the refugee camps that house displaced Karen tribe members who have fled the despotic Burmese government over the past 20 years. 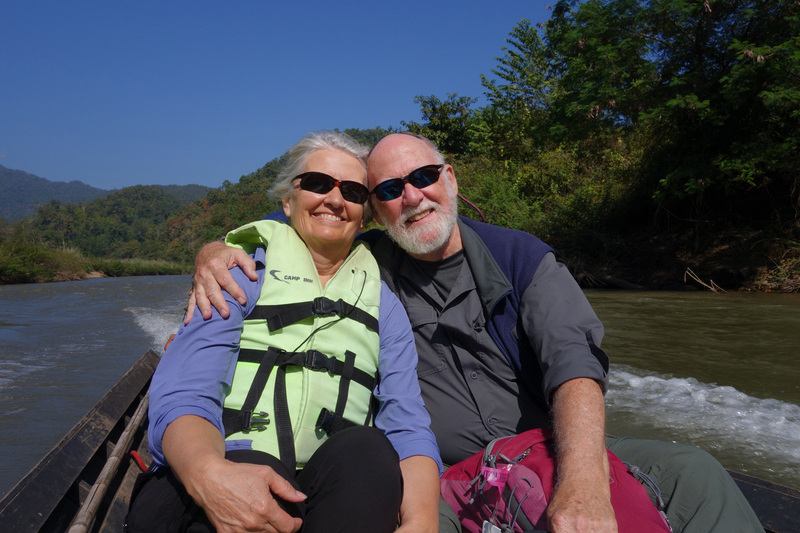 The Mae Hong Son valley we landed in is beautiful. 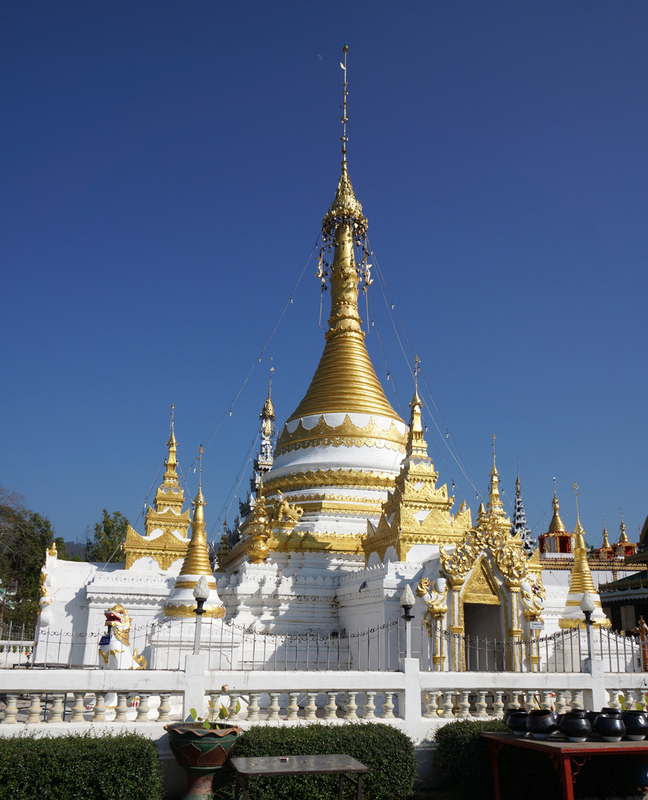 There were several unique Burmese style temples/wats in town and a brilliant white stupa on top of Doi Kong Mu high above the city. 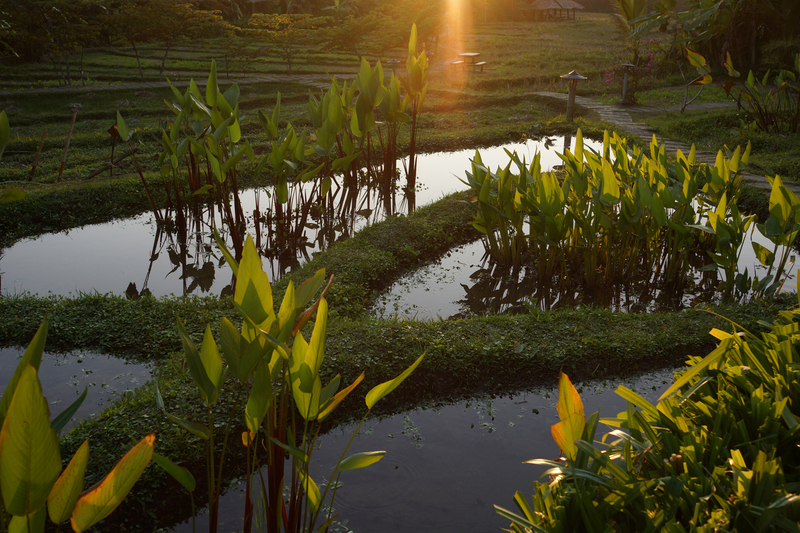 We stayed at the eco-friendly Fern Resort, just outside of town, overlooking rice paddies and banana trees beneath the hills in the heart of the forest. 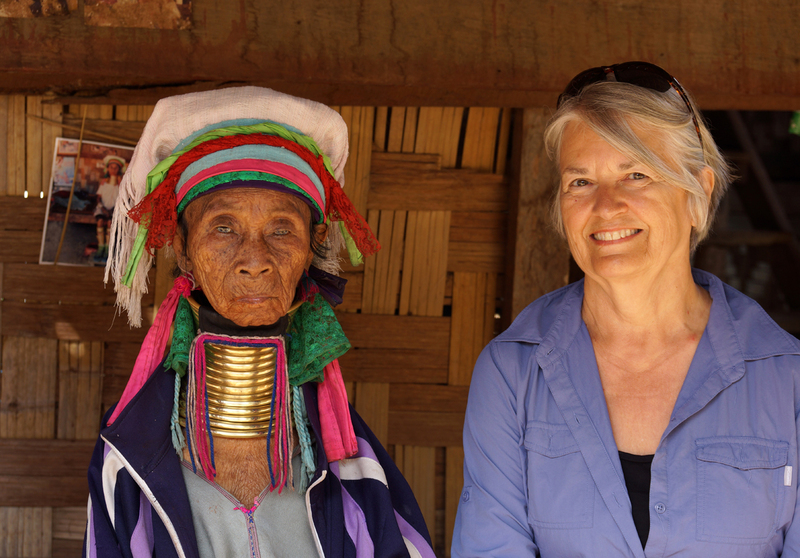 It was staffed almost exclusively by members of the Karen Tribe who live throughout this area. 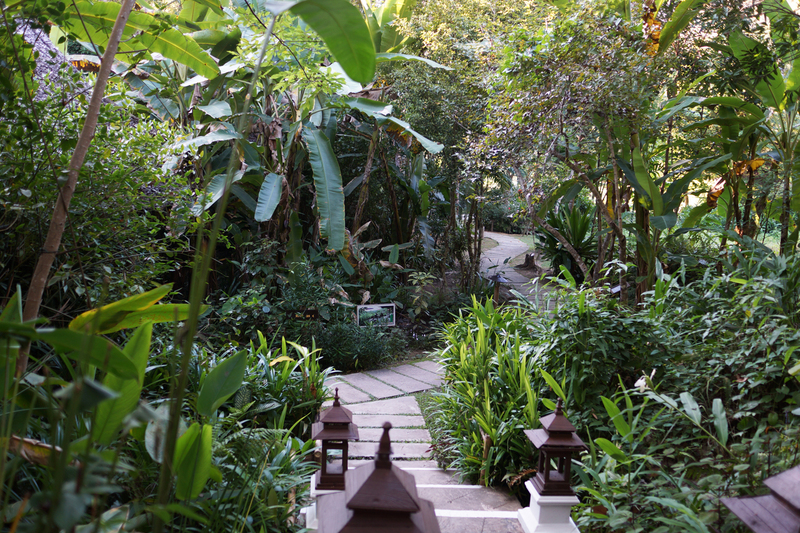 Peaceful in the extreme, and well-situated bungalows to enjoy the setting. 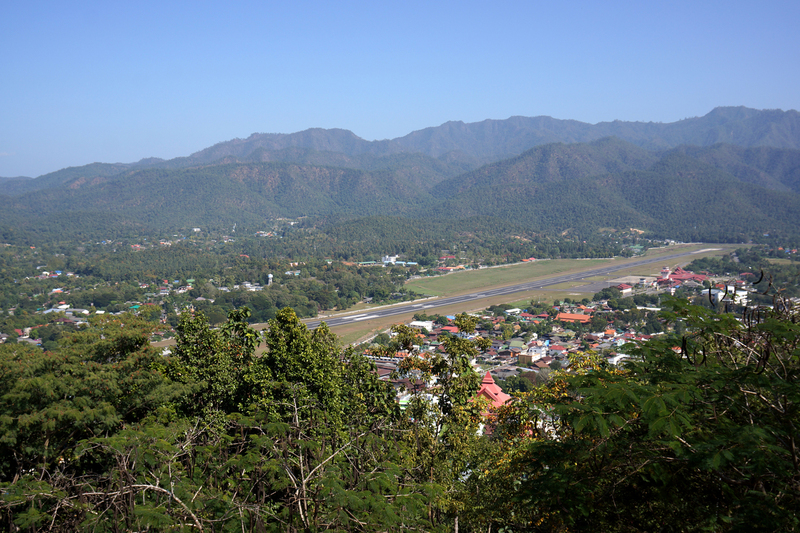 Mae Hong Son and the shortest jet-capable runway in Thailand! 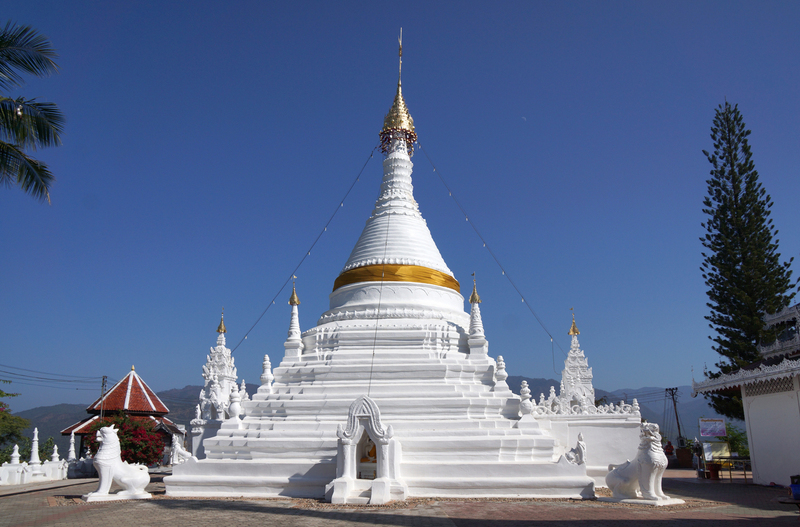 Wat Phra That Doi Kong Mu Temple, on the hill overlooking the town. Evie and Bing, our wonderful guide, up here in the NW. 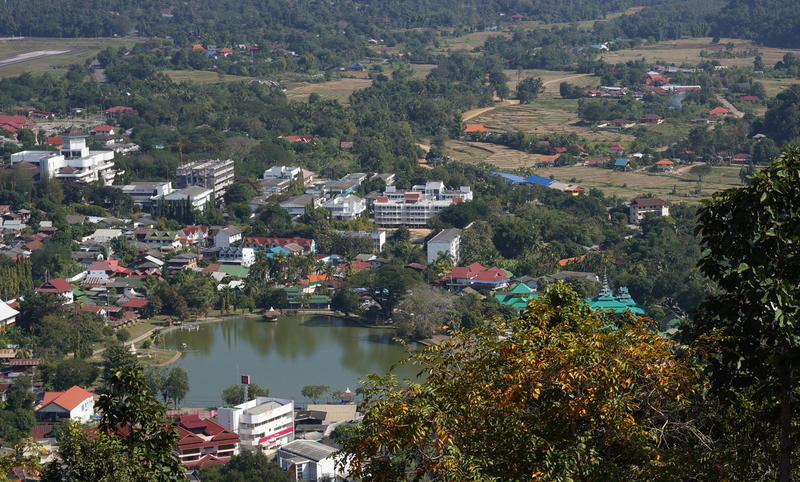 The townsite as seen from Wat Phra That. 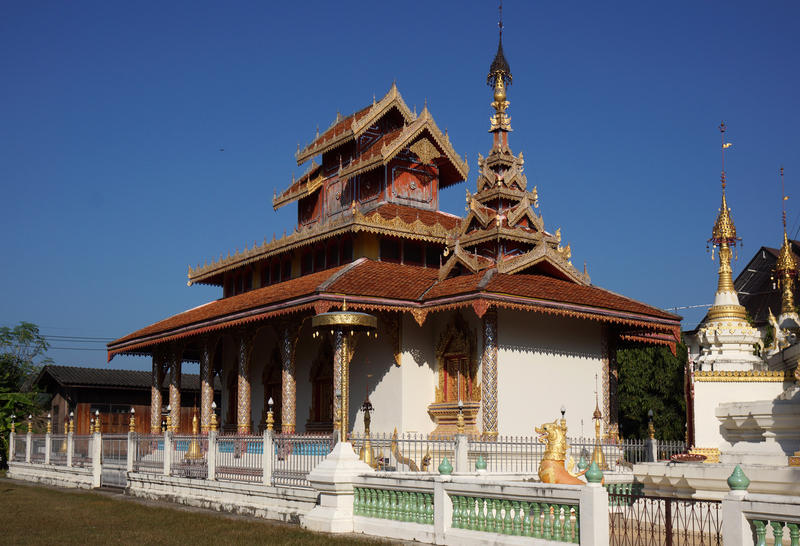 Two distinctly different temples right next to each other on Jong Cham Lake; the Wat Chong Klang on the left and the Wat Chong Kham on the right. 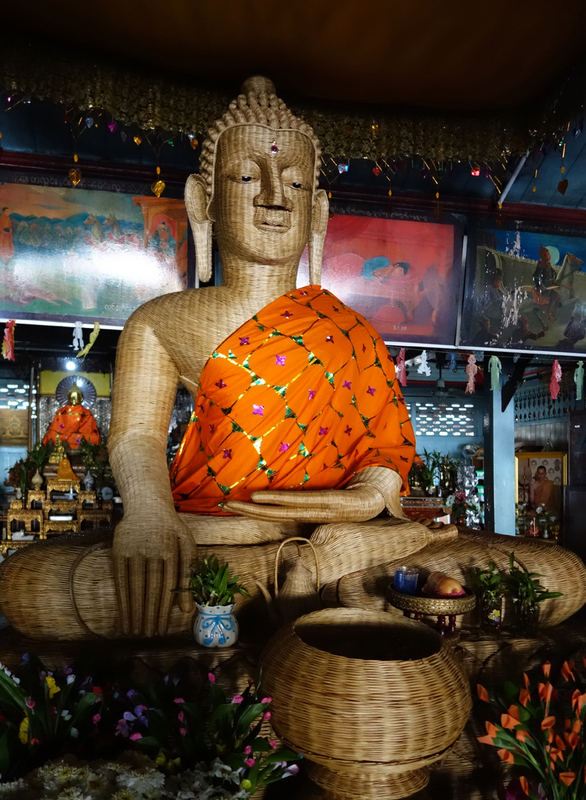 A Buddha woven entirely of bamboo, crafted by a local woman. The only one of its kind! and a great source of pride to this community. 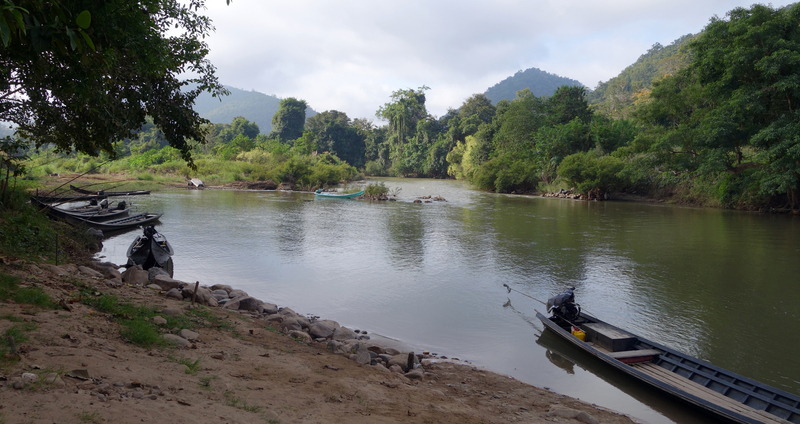 We took a boat trip on the Pai River to visit the mysterious Padong Long-Neck Tribe at their village of Baan Nam Peing Din. 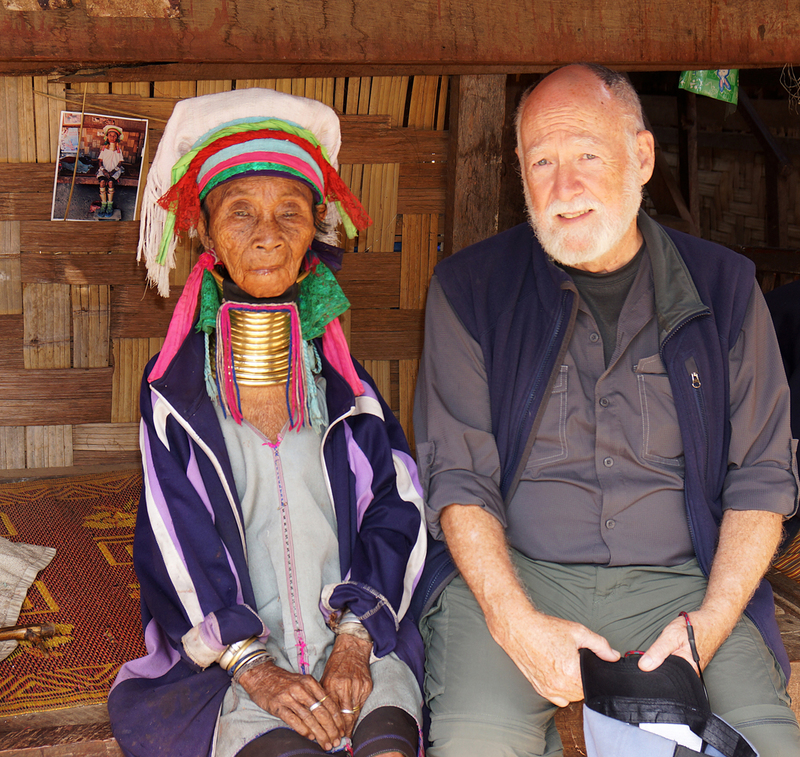 It was interesting to learn that this Padong tribe are a sub-group of the Karen people living in eastern Burma and elsewhere in northwest Thailand. 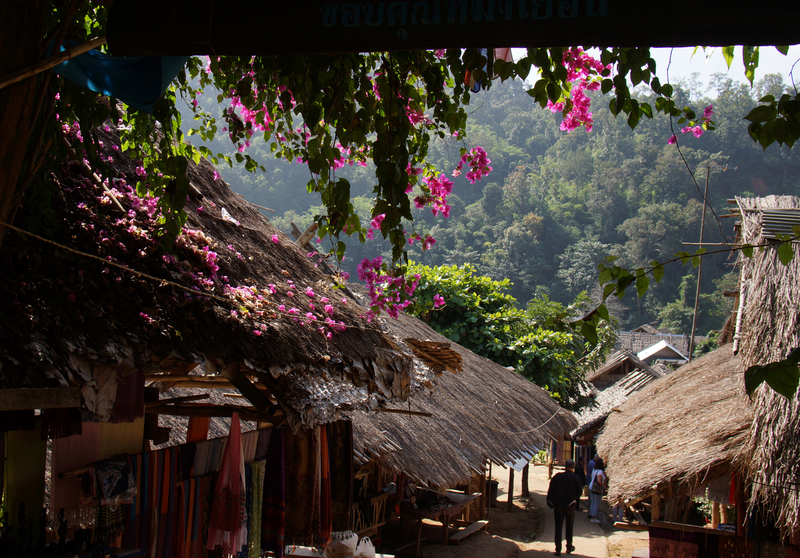 This particular village is a relatively new location for the tribe. 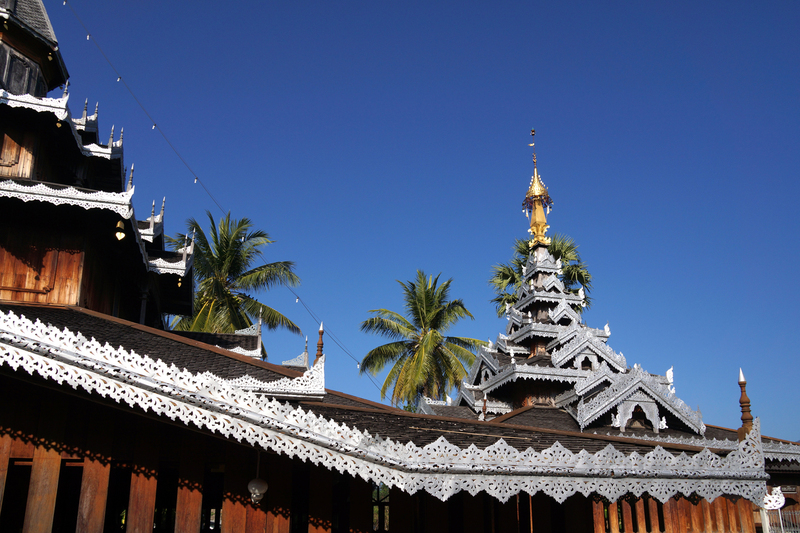 Having been persecuted in neighboring Burma for many years, they jumped at the chance to relocate across the border in Thailand, at the request and providence of the Thai government. 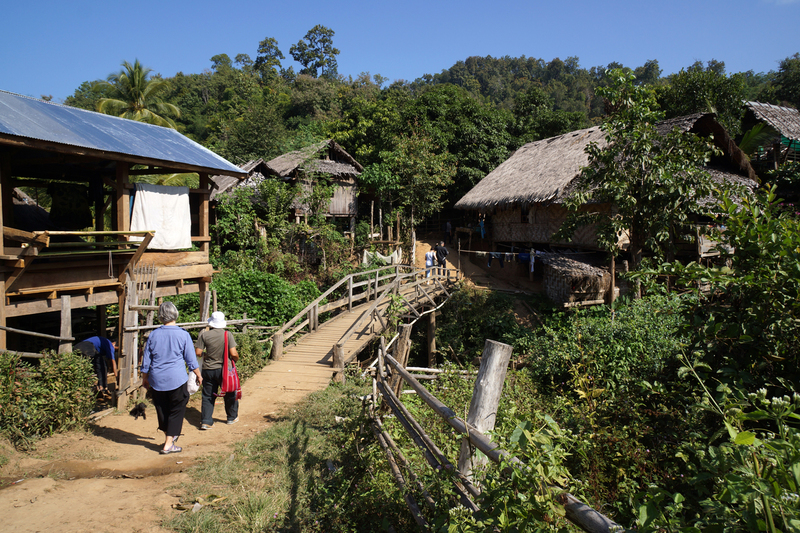 They don’t own enough land to farm traditionally here, but the Thai-govt provides for their community needs (including a school, clean water, sanitation ) and in return, theirs’ is an open-community where tourists are able to get an up-close and personal look at this different lifestyle. It was evident that they were used to the tourists and easily welcomed them. 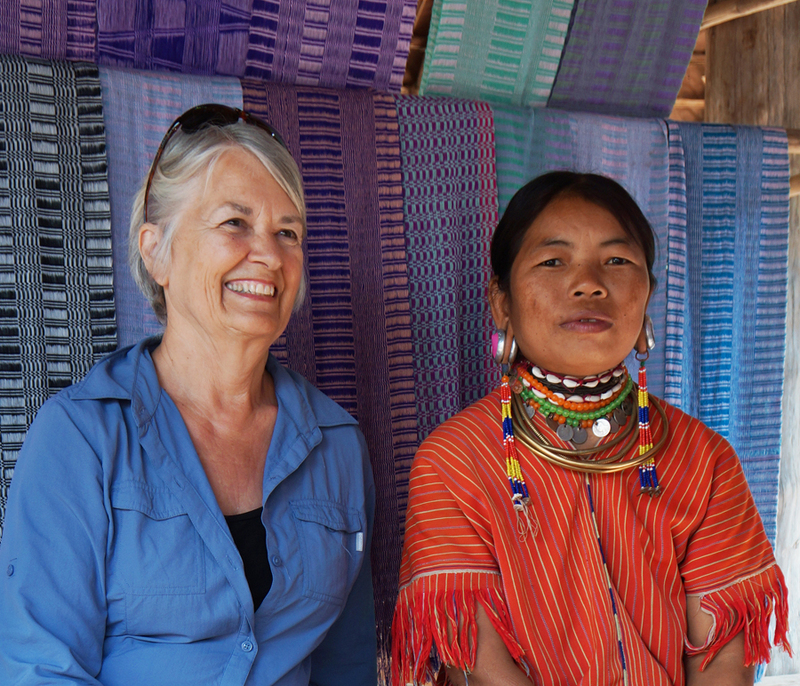 They were very friendly, but never pushy in trying to sell us items they had crafted. Here is our boatman to take us to the long-neck village. A prefect day for a boat ride on a beautiful river. Very striking woman. 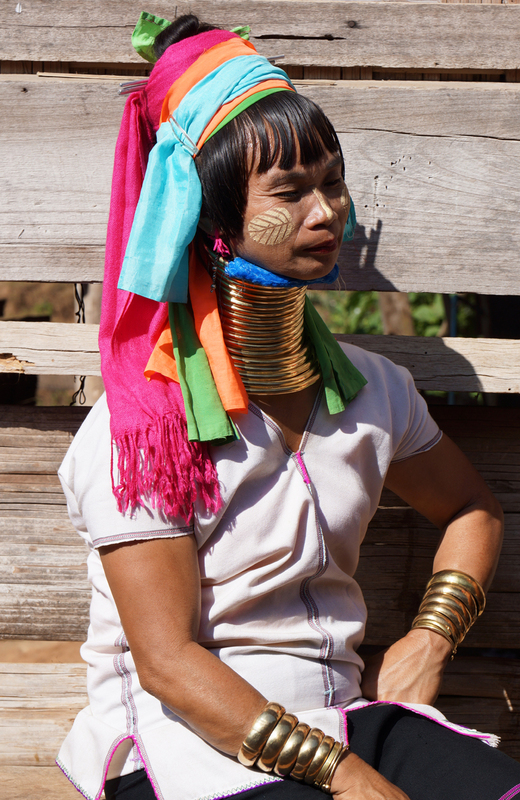 Note that the neck rings come in several different sections. Easier to take off and easier to add new ones when “needed”. 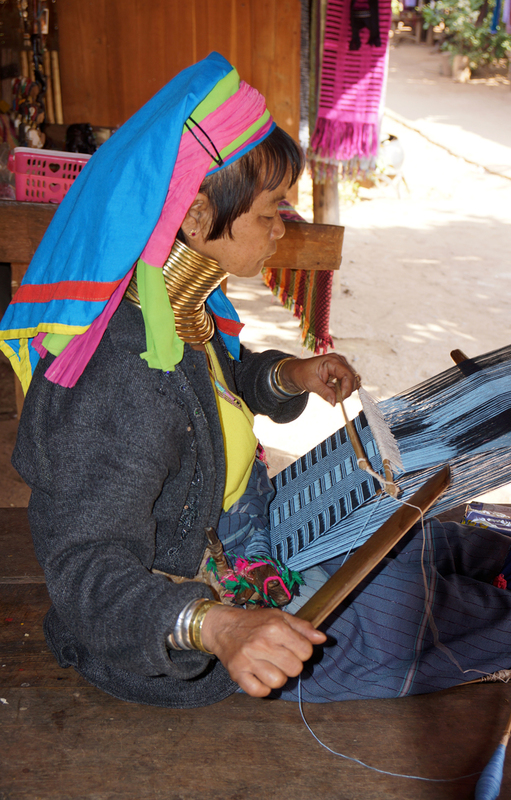 Many weavers in the village, and they were all doing expressive work. She wanted me to try — (to my sisters ,this looks like a good way to get rid of the “Smith” double- chins) Reminds me of a body cast I once had a long time ago . . . This old woman insisted that we have our picture taken with her. Don’t have a clue how old she is. She insisted Gary have his picture taken with here as well. I had many stickers for the children. Wish we had packed some real balls, as on the way back to the boat one of the boys was trying to kick the sticker down the path. 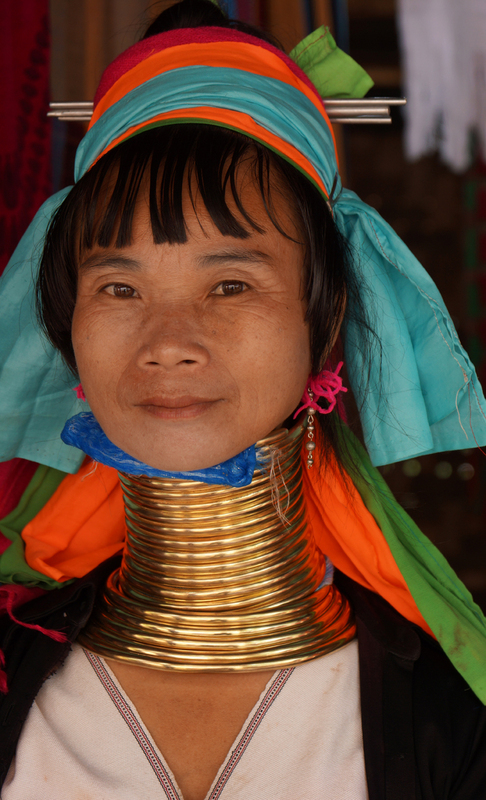 Not all of the woman now-a-days wear the golden (actually brass) necklaces that stretch their necks. It was interesting to see information from a study of x-rays done on these women, that it didn’t actually stretch their necks, but rather lowered their collar-bones, while squashing their vertebra. 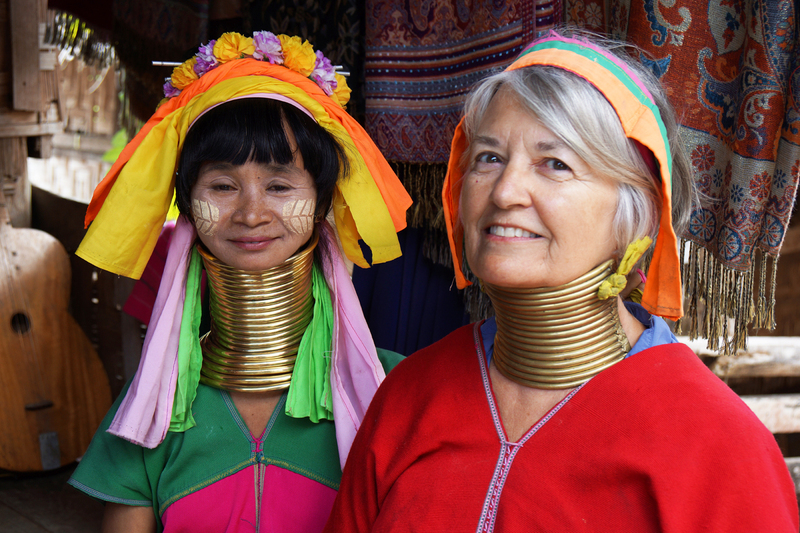 The women with the “long necks” are very proud of their appearance! We were told that today these women have a choice of wearing the collars or not; but if they start this procedure with girls at 5 and 6 years of age, like we were told, I am not convinced they really have a choice! Also if this is a tourist financial necessary it seems that it will continue. 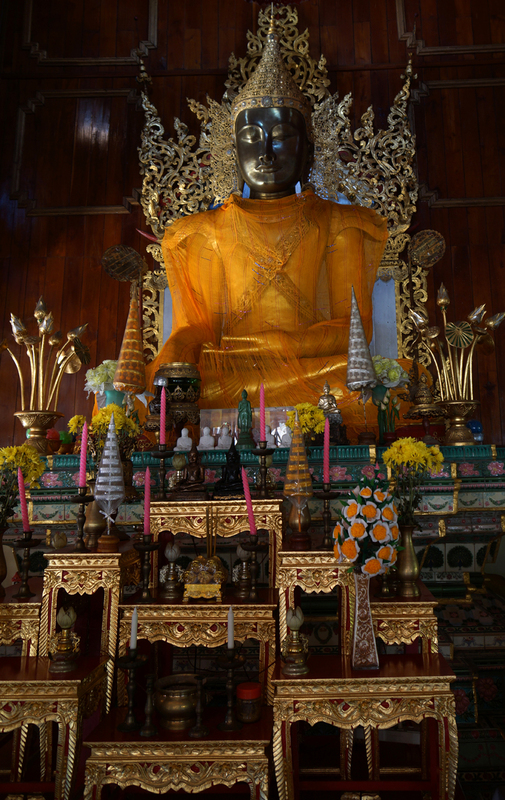 We had mixed feelings about being there, but later reflection had us thinking that, without the Thai governments help, and without tourist income from their crafts and visits, their’s would be a much poorer existence. 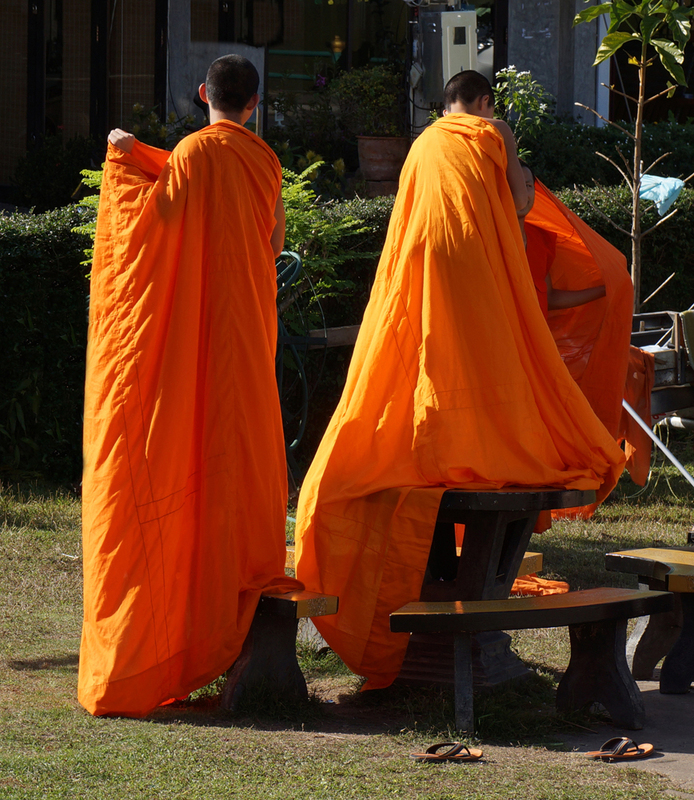 Love the Thanaka paint on their cheeks which is used for protection from the sun. 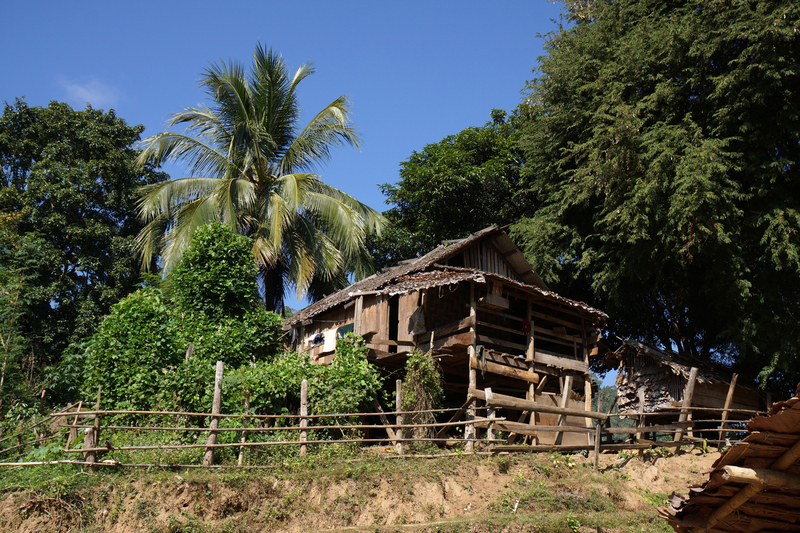 This is a more common sight in Burma than in Thailand (where it gets much hotter!). Our guide brought along packages of instant noodles to give to the villagers. Something they don’t get and LOVE to eat. We continued through the village and were able to go into a kindergarten class that was in session. 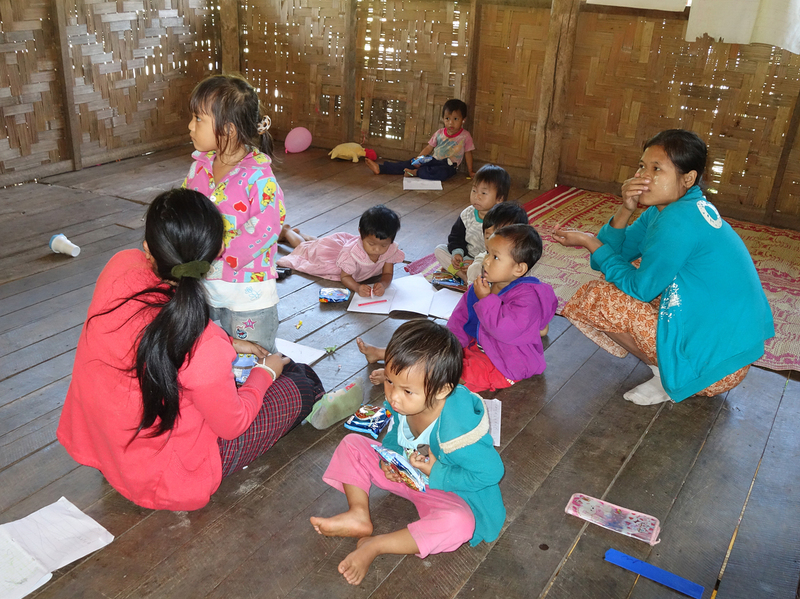 These kindergarten children were learning the Burmese language, in addition to their tribal dialect, and Thai language!! Appreciative for the package of noodles, and just maybe a break from learning all those Burmese scripts!